Do you want to be part of the founding team in a small (but well-funded) startup that is going to become a great company? Here is your chance to demonstrate technological leadership and make a true impact in a great SaaS company that is going to leave a mark on the internet. Bablic is built with cutting-edge technologies and lives on the cloud. You must know your way around web standards HTML5\CSS3 and able to integrate with 3rd party services via API. Are a team player. If there are problems, inconsistencies or underperformance you will report and discuss this promptly and openly. We like challenges and opportunities to learn from mistakes. 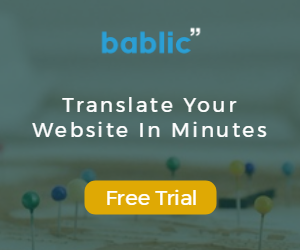 Bablic is a SaaS solution for SMBs that completely automates the website localization process. We are able to turn mono-lingual websites into multi-lingual (using professional human translation) by simply pasting a code snippet in the site. This significantly reduces execution times and costs for businesses. Bablic works with any website and requires no programming, no project management and no alteration to the website’s existing CMS system. Bablic provides easy and intuitive tool to manage any website using reverse proxy and crawling methods. We are located in Tel Aviv, have paying customers and our users LOVE our product. Contact us for more information or send us your CV at [email protected].